What went down in Greyton. Close friends will know that my wife and have had a fairly dramatic start to the year with regards to our guest house in Greyton. The Lord Pickleby. The man managing our guest house turned out to be more of a rogue that Lord Pickleby himself and after several months of questionable and evasive behavior, and almost 10 months of non-payment, I was forced to race out there a few weeks back to fire and evict him. 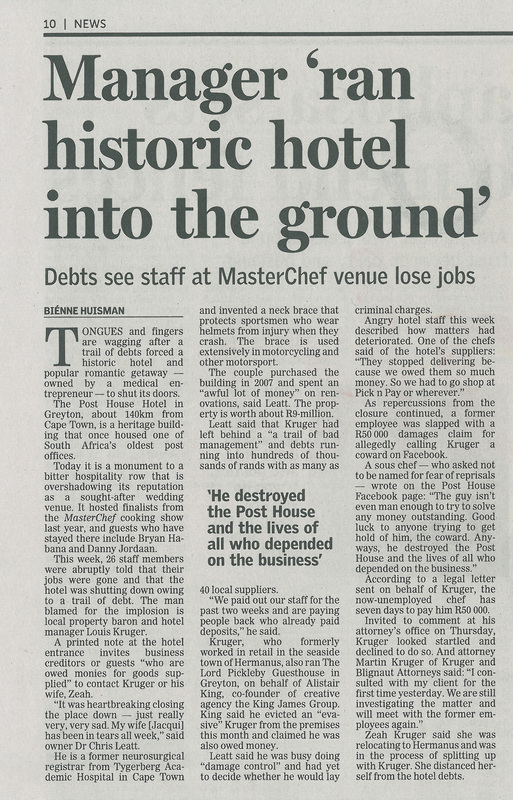 In hindsight, we got off relatively lightly, unlike the poor people who own The Post House, Greyton’s iconic historic hotel. The full story is here, as reported in the Sunday Times, Sun 17, 2013. The good news is that the Lord Pickleby is likely to continue to operate, new and improved under new management. And there we thought Greyton would give us a taste of the quiet life.